Fears over radar interference causes Department of Defense to stall Oregon's largest wind project. While the United Kingdom is enlisting radar in the protection of wind turbines from aerial attack (see last week's: " Radar security for offshore wind farms "), the Pentagon has helped deny an American wind farm a Federal Aviation Administration permit due to radar concerns. Rotating turbine blades can reflect radar signals, which creates sensory interference for air defense surveillance. The Air Force worries that the proposed Shepherds Flat wind farm—what would be the largest in Oregon—might compromise a radar station in Fossil about 50 miles away. Caithness Energy was to begin construction on the farm May 1. 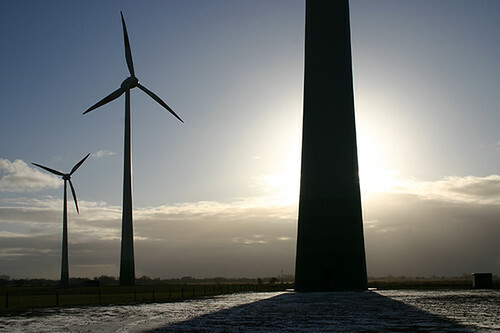 Any significant delays in construction could kill the wind farm, according Caithness Executive Vice President Ross Ain, because the project, which would take 18 months to complete, will lose its eligibility for federal stimulus funds unless it's finished by the end of 2012. In addition, the farm is supposed to start supplying power to Southern California Edison by late next year, and the utility is under pressure to meet the state's strict renewable portfolio standards. Further, General Electric agreed to a $1.4 billion contract with Caithness last December to fit the 845-megawatt wind project with 338 turbines. Three other wind farms of Iberdrola Renewables, which are located in Oregon and Washington, might also be at stake. For the four farms to fall through at this late stage would hit the wind industry hard. Apparently, officials from DOD and White House are in discussions over the issue. About 16,000 jobs are also in the balance.